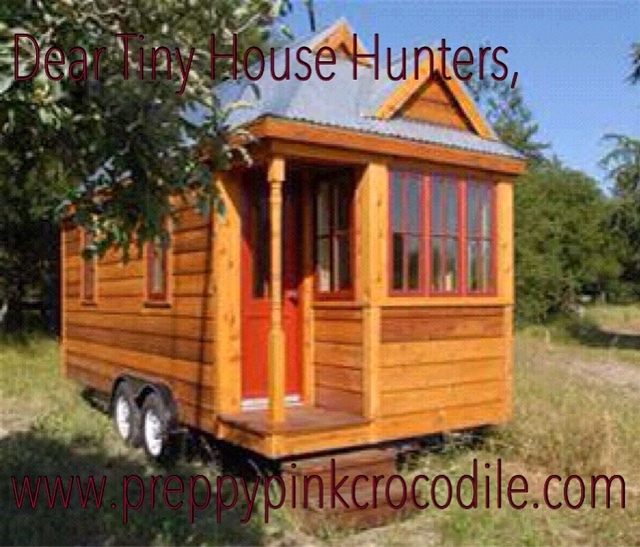 I get the initial appeal of the perfectly adorable Lilliputian-esque tiny houses. I've been watching the YouTube channel that the HGTV show ripped off for a few years. Those teeny tiny itty bitty homes are completely charming and look so fun. Like those fancy playhouses that I used to drool over in the Christmas catalogs as a child. I think I could even do it for a year or two. I could scale way way down and live tiny for a finite period of time on a lark. And it could be super fun if you owned a lake property to have a few set up instead of a big house. But that's all far too level headed and rational for most of y'all on Tiny House Hunters. Tiny House Hunters like to drivel on and on about how they are into living tiny and with a lot less....until they actually get inside the first house. The moment they step inside, they suddenly forget all their jabber about wanting to scale down and live within your means and spend quality time together. Have you even seen a tiny house before? You didn't think to google the heck out of it before you went on the show? Almost universally you are all shocked that the tiny houses are in fact....sit down for this late breaking news...tiny. Where's the closet? I have 984 pairs of shoes, where will they go? I can't stand up in the bedroom. It's simply impossible for me to sleep on anything smaller than a California King size bed. I have 2 giant mountain dogs, where will they run? What's a composting toilet? I don't want a composting toilet. I need a bathtub. Why is there no dishwasher? How will I host a dinner party cooking on a camping stove? But I can only fit two dishes in the entire kitchen. Where will I go to get away from my husband/kids/partner? But I need a separate office. It's all so tiny! What did you think you would get for $30,000 and 150 square feet on wheels? Seriously...what the heck were you expecting? You are getting a glorified Barbie Dream House. It's cute and sweet but as the title indicates...it's effing tiny. Please HGTV say you will do a follow up show to see how this all panned out for some of these people! And in the mean time, I strongly encourage wannabe Tiny House Hunters everywhere to take a look at your current apartment. Then walk into your bedroom. Then figure out a way to live in less space than said bedroom. That's tiny house living. Don't you dare proclaim you are ready to live in a tiny house until you go through that exercise, you tiny house wannabes. Living in a Barbie Dream House isn't for everyone! Your post made me laugh so hard!I think the same thing whenever I watch this show, and would also love a follow-up show: Tiny House Living Divorce. Yeah, no way in hell. Why someone would want to love that way is beyond me.